We are all guilty at some time or another of leaving a meeting and not knowing who has next steps or action items. Creating a standard template can help organize your notes and keep everyone on the same page. If you're a OneNote user, it's easy to create a custom template and email it out directly from OneNote. Our sales team has been using a custom OneNote template to record and email meeting minutes. Using this template has saved time and increased customer satisfaction. Rather than waiting hours (or days) for the sales person to go back and type up hand written notes, we're now able to provide meeting notes within minutes. 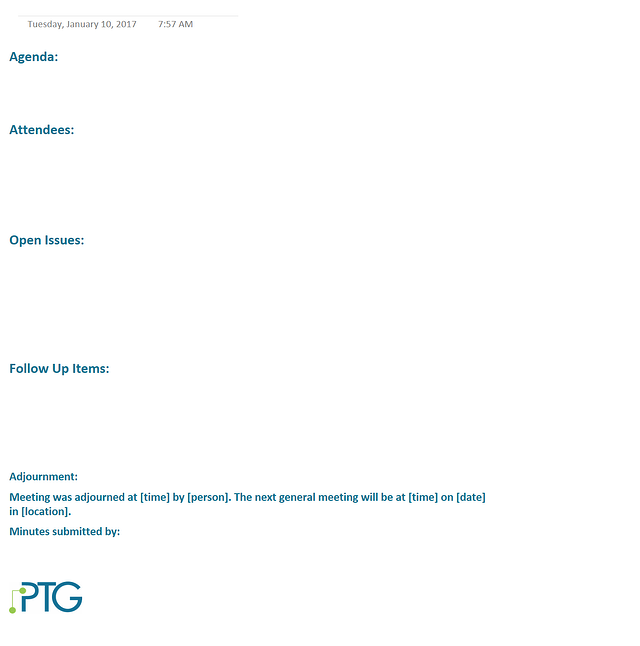 Once this is set up, save this as your meeting template. To do this, click the Insert button on the ribbon and select "Page Templates." A Templates pane will open on the right (this is also where you can find pre-existing templates). At the bottom, click "Save current page as a template." Name your template and make sure the box is selected next to "Set as default template for new pages in the current selection" if you want every new page to be in the template. If you don't want this to be the default template, you can choose this template from the "My Templates" section of the "Templates" pane when you want to use it. You're template is ready to use during your next meeting. 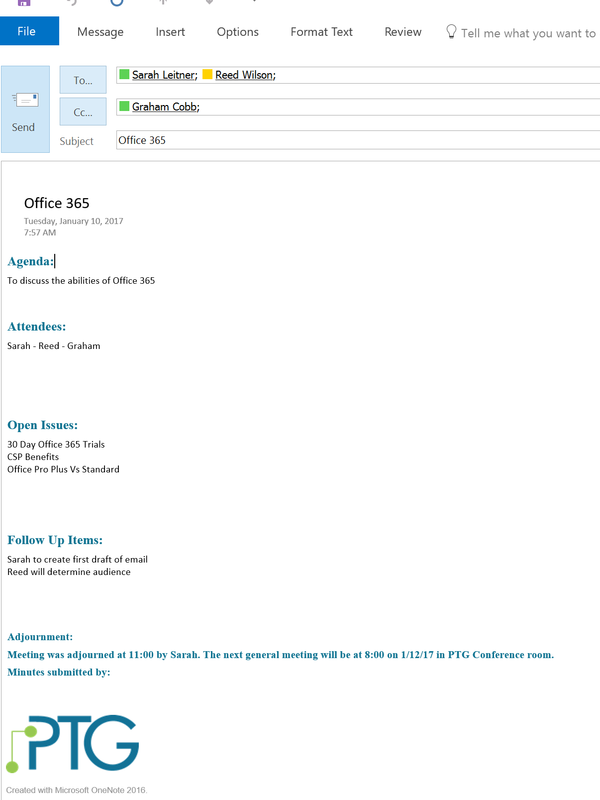 To keep everyone on the same page after the meeting, you can email the attendees the notes from OneNote. This drops the OneNote page into Outlook and makes it very easy to get everything you just covered out to your team or clients right away. One of the best kept secrets within Office 365 is OneNote and the massive capabilities it has to offer. 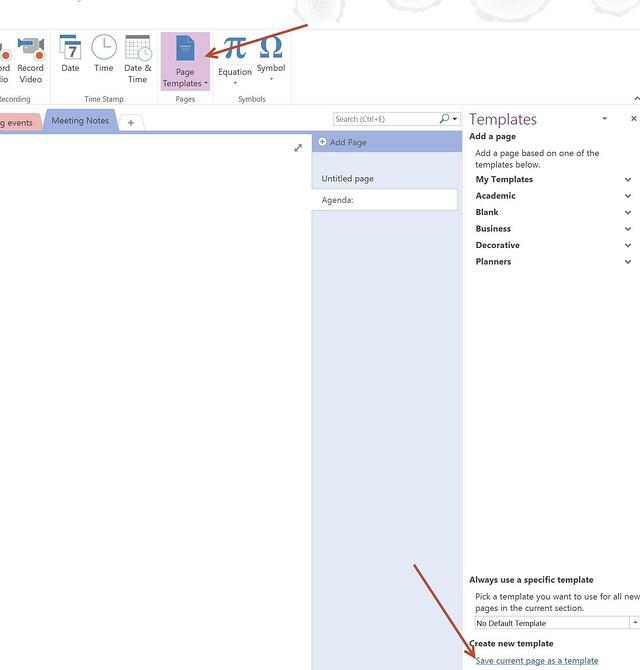 Even a lot of Office 365 power users are unaware that you can create OneNote templates and import them directly into emails. Using this method for meeting notes has saved our sales teams time and increased customer satisfaction by providing clear, organized meeting notes within minutes.